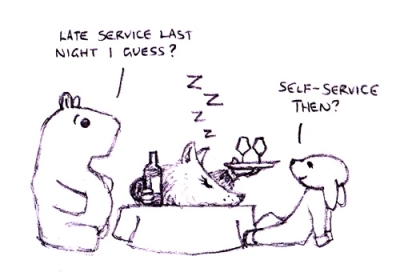 Is it fair to review a restaurant that you visited on a “special” day? In this case, New Years Day for lunch. My friend Tim was quite prescient in saying “we shouldn’t expect too much, the staff will be tired after last night.” But surely a restaurant should only open its doors if it is going to bring its best game? If they put a note on their website saying “open for New Years Day, but please don’t expect our best” would many, indeed anyone at all, book a table? So, this is the Churchill Arms, Paxford, a village in the charming Cotswolds which were looking even better for being seen on the first sunny day for the last twenty years (or so it feels). The pub itself is lovely, with all the feel of a country inn that has been evolving its way through the past few centuries to arrive at the cosy lived-in yet classy look it has today. Big inglenook. Random collection of chairs. Photos of pheasant shoots upon the walls. Rugged young professionals in cable-knit jumpers being altogether too chipper on the next table. heaving with people all wanting food and drink; it may have meant eating elsewhere, but I could wish that they had refused our booking and given themselves more breathing room. All this may have made us grumpy but I’ll allow it, given this was New Year’s Day. And my starter was pretty good. 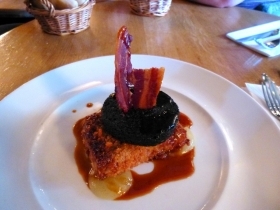 A bread-crumbed ham hock terrine, topped with a generous slice of black pudding, some crispy bits of smoky bacon and a dollop of pear puree. This made for a very pleasant meaty overload. My main course was disappointing, though. 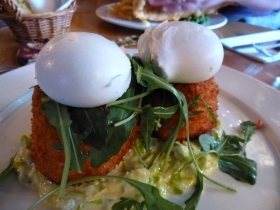 Salmon fishcakes with poached egg and creamed leek. The fishcakes were so dense as to be beyond dull. You can put too much fish in a fishcake, and these were 110% fully-cooked baby-pink mashed-up salmon. I chewed and gulped my way through as much as I could, also becoming aware of a harsh note of uncooked cayenne pepper on my palate. Maureen’s fish and chips were greasy, the batter not particularly crispy and the tartare sauce lacking any really zing. I asked about the burger across the table and got a non-committal nod, perhaps a “fine”. Sticky toffee pudding and apple crumble were both fine too. The coffee was nasty. If Harden’s write-up is accurate, we got the Churchill Arms on a bad day. But that’s just tough (for them and us!). I don’t think any restaurant should be opening its doors if it isn’t going to offer the best it can do. Or if it does, it’s going to risk getting a bad review. Because one thing is for sure: there will be more amateur restaurant critics stalking the streets in 2013 than there were in 2012. Happy New Year!